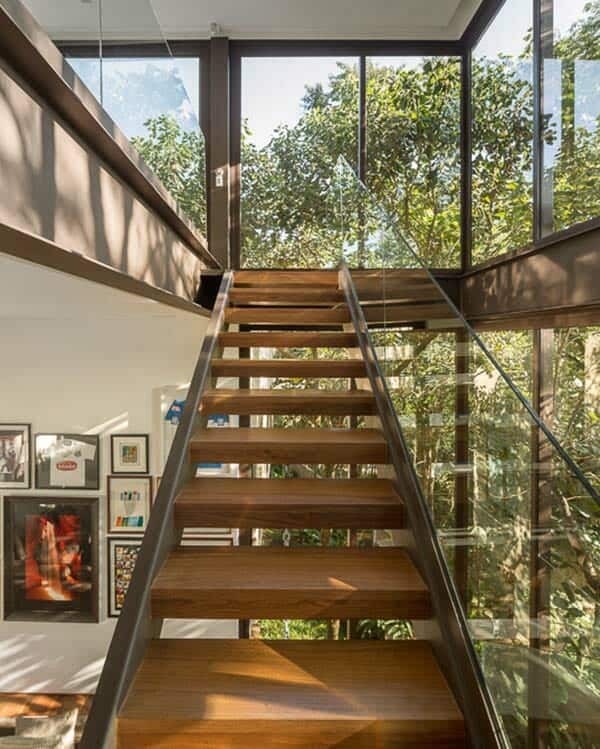 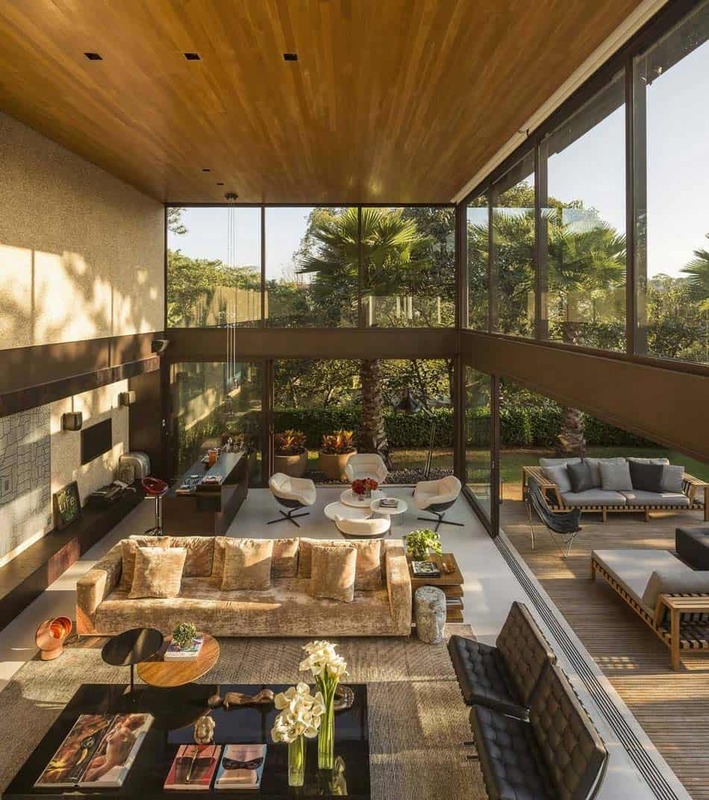 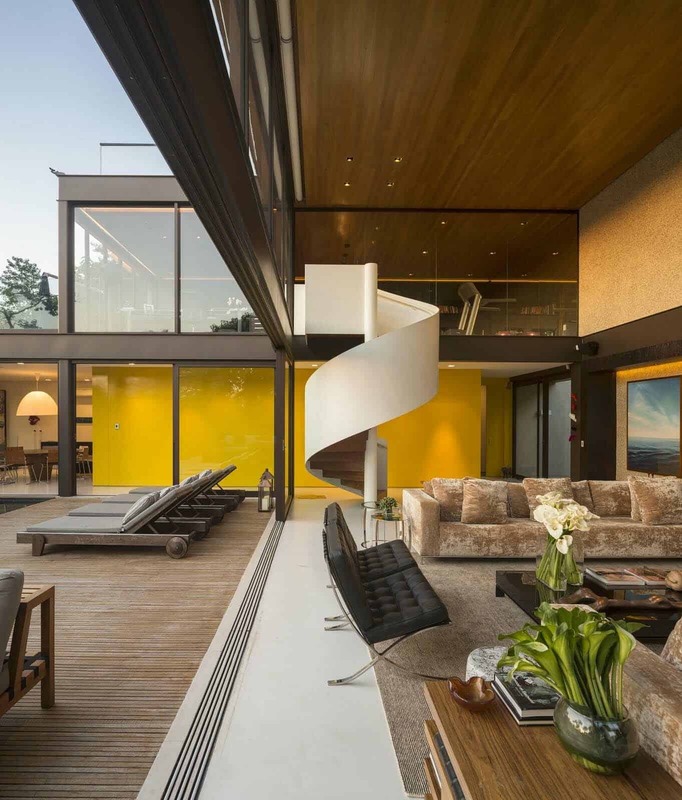 This contemporary dwelling of steel and glass designed by architect Fernanda Marques is located in the upscale neighborhood of Cidade Jardim (Garden City) in the West Zone of Sao Paulo, Brazil. 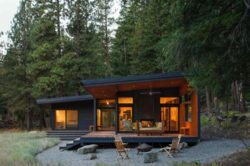 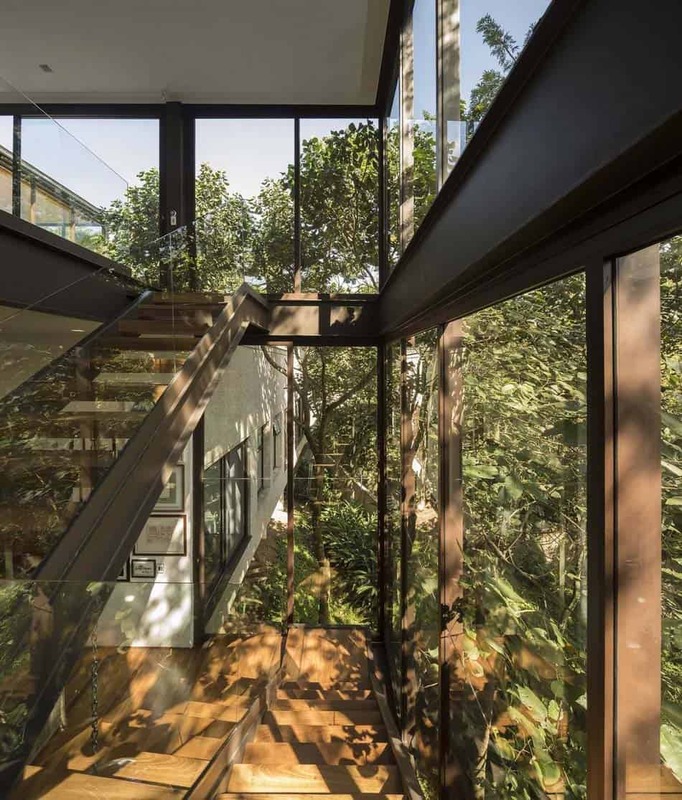 Nestled on a steeply sloping site of 8,395 square feet (780 square meters), this three-story residence encompasses 8,826 square feet (820 square meters) of living space. 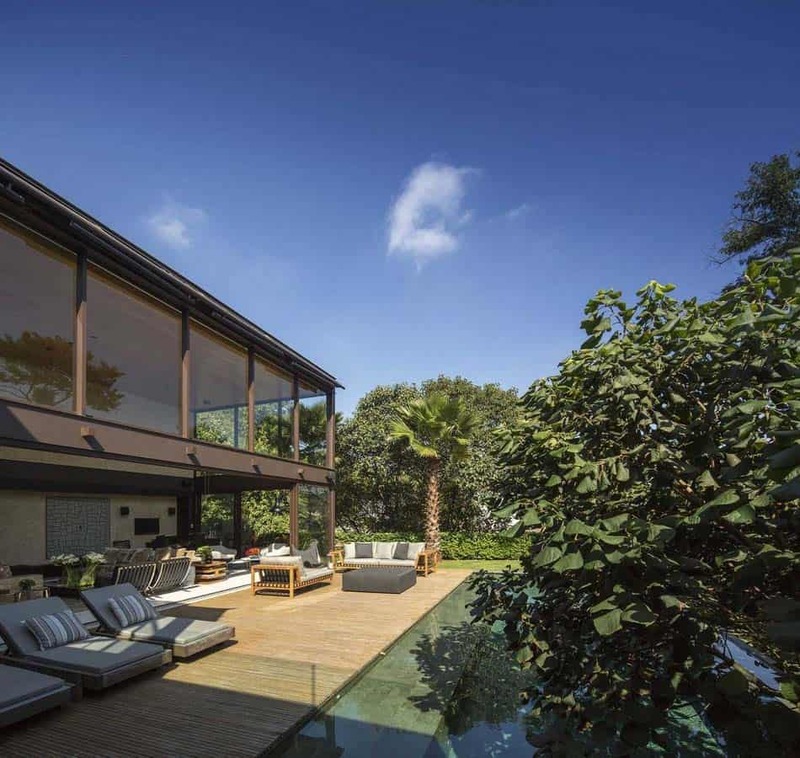 Containing 13 different rooms: living, dining, kitchen, mezzanine, kids’ playroom, three bedroom suites, powder room, two staff suites, plus laundry and garage — this project is completely open to the surrounding greenery and offers spectacular views yet provides complete privacy. 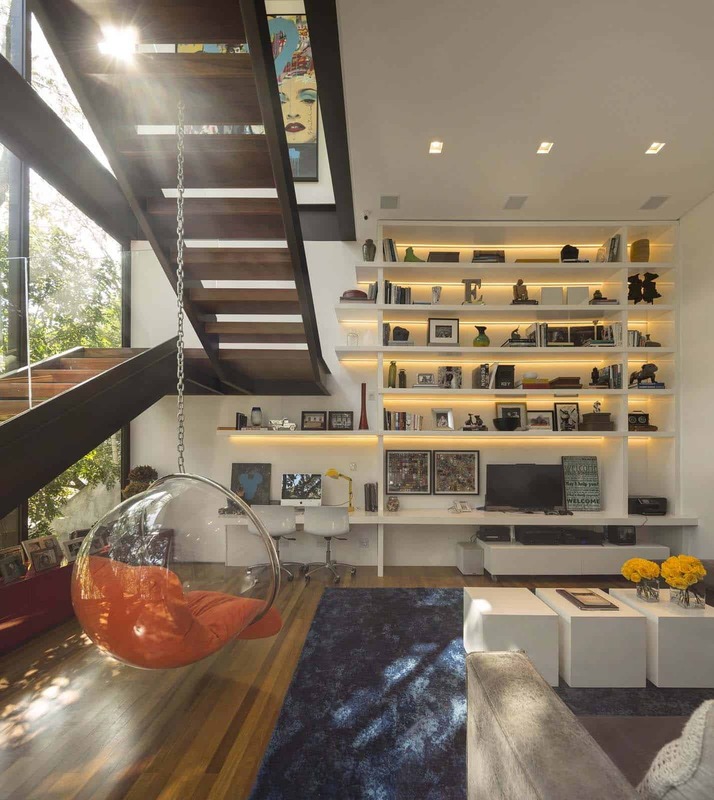 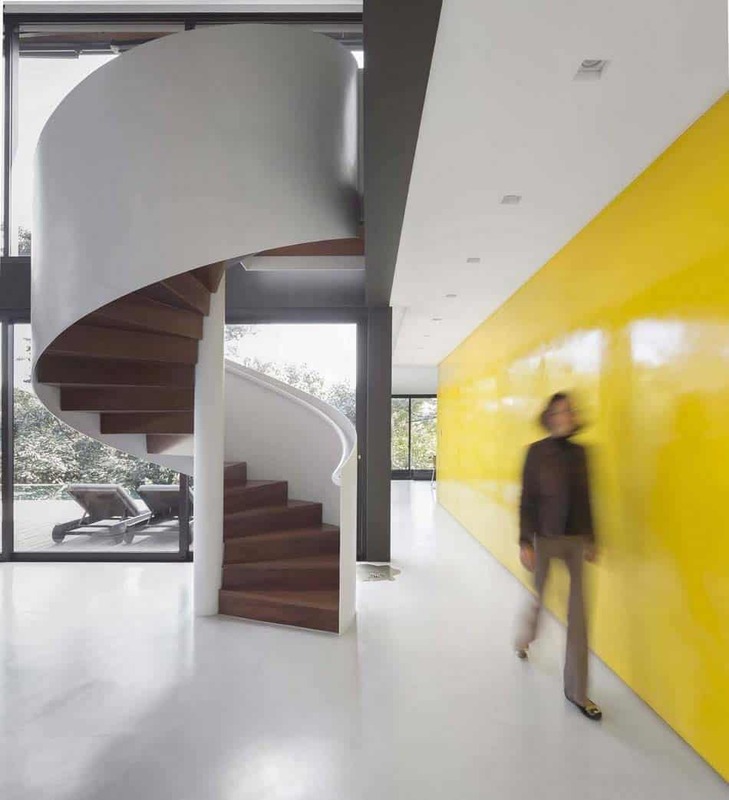 The family engaged architect Fernanda Marques to create a home that functions well as an everyday residence for the active family, but also lends itself to frequent entertaining. 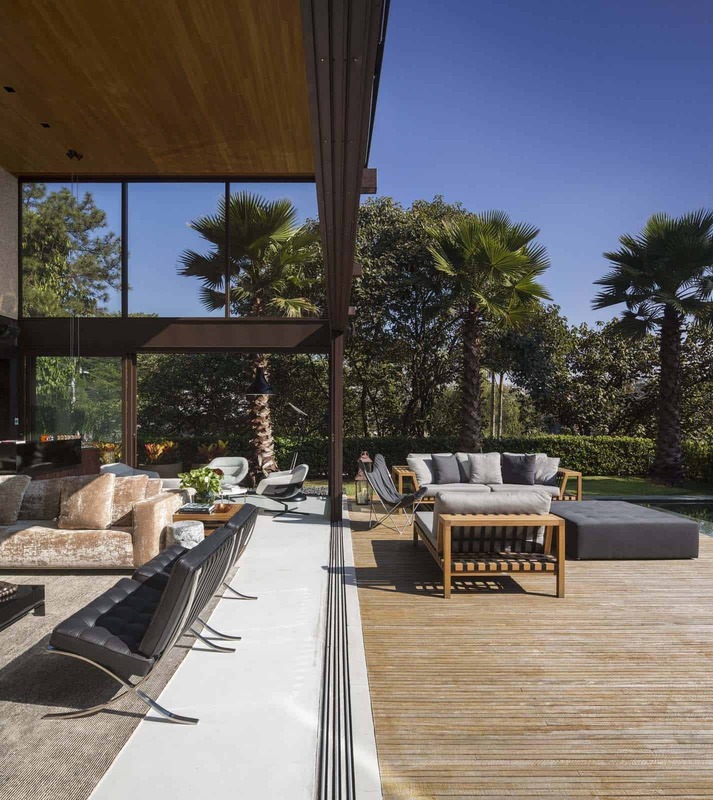 Marques achieved a beautiful balance between maximum transparency and privacy, and managed to insert the building into a challenging plot while preserving the existing trees. 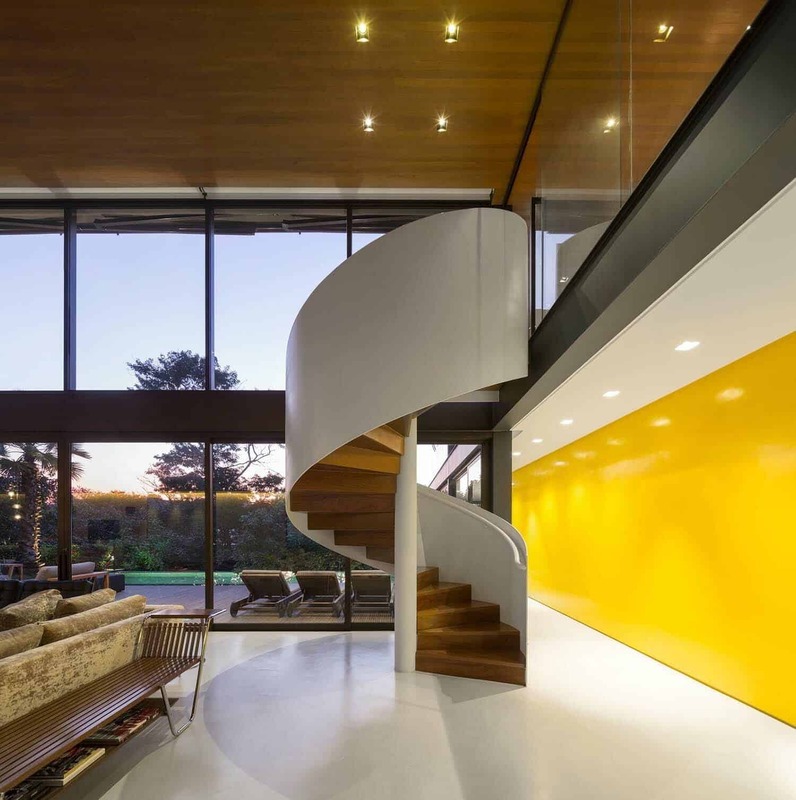 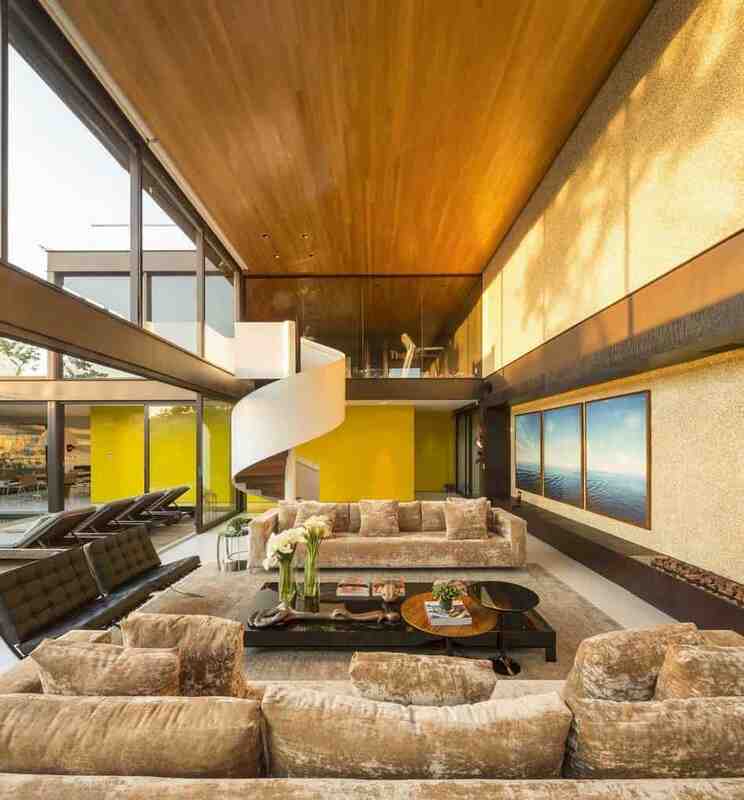 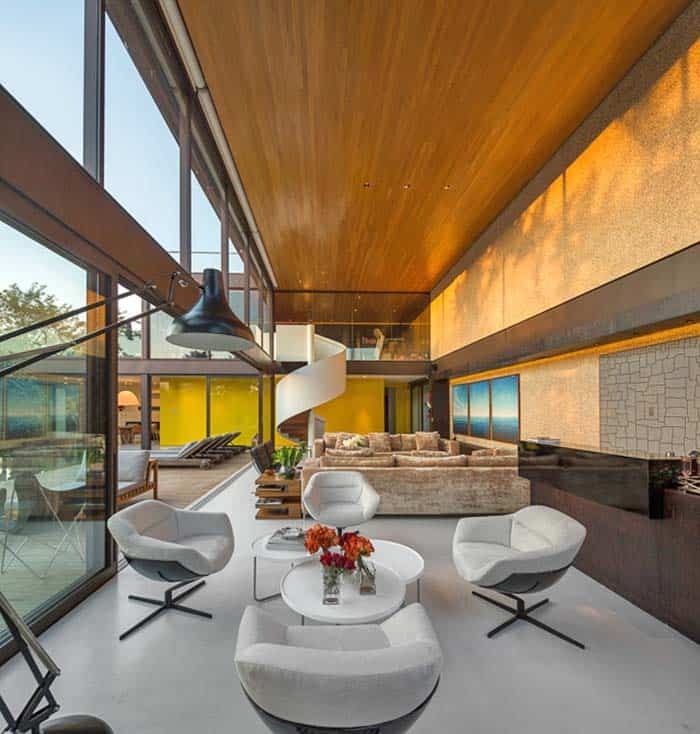 Using glass, steel, and concrete, Marques created a timeless house in the spirit of Mies van der Rohe who was the architect’s inspiration for this project. 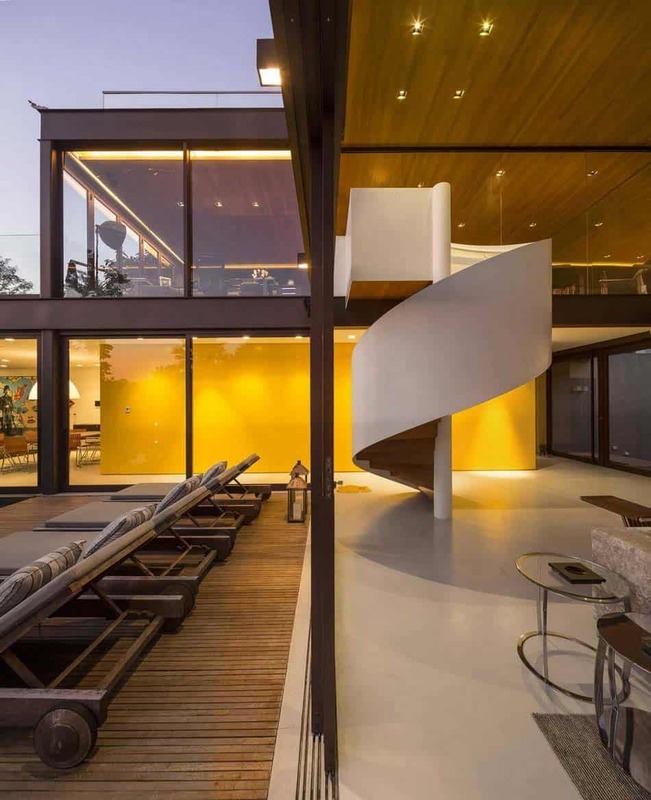 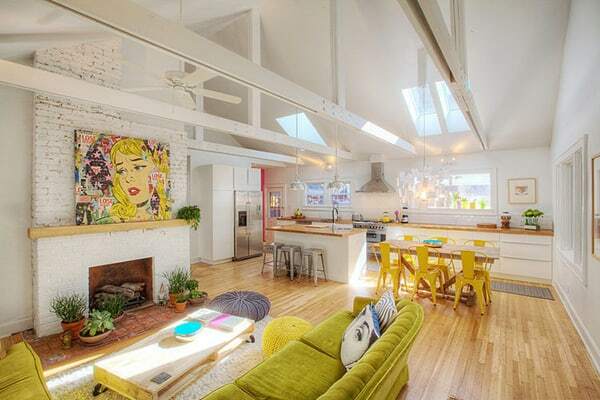 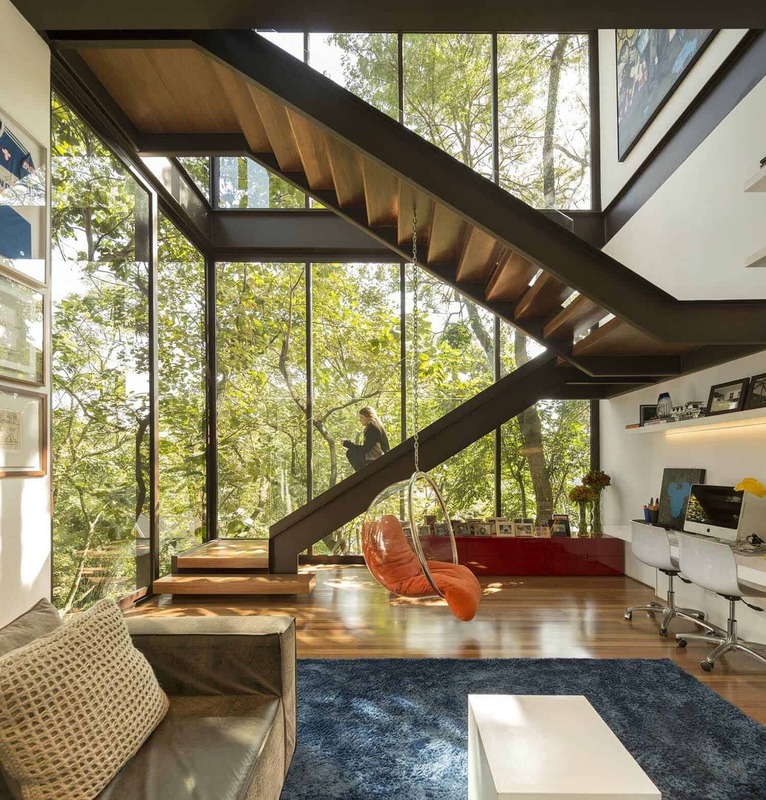 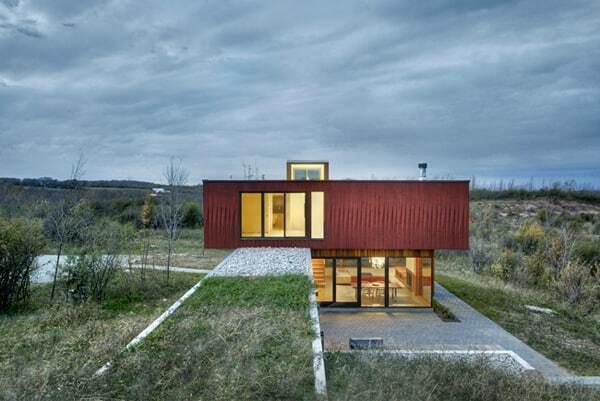 What We Love: This contemporary dwelling features amazing living spaces both indoors and out. 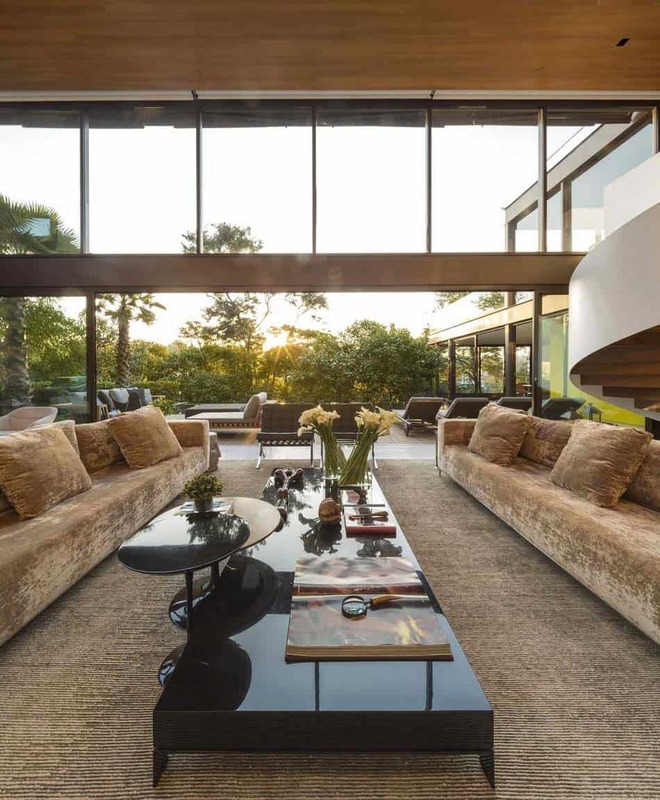 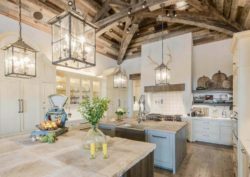 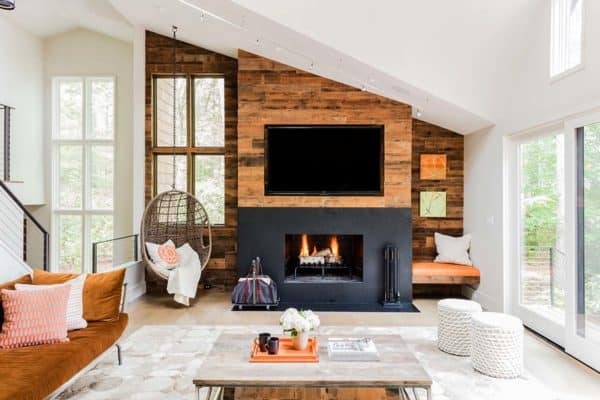 From the double story living room with its walls of disappearing glass that soaks in the outdoors, to the stylish furnishings and accessories, this home is ultra fabulous. 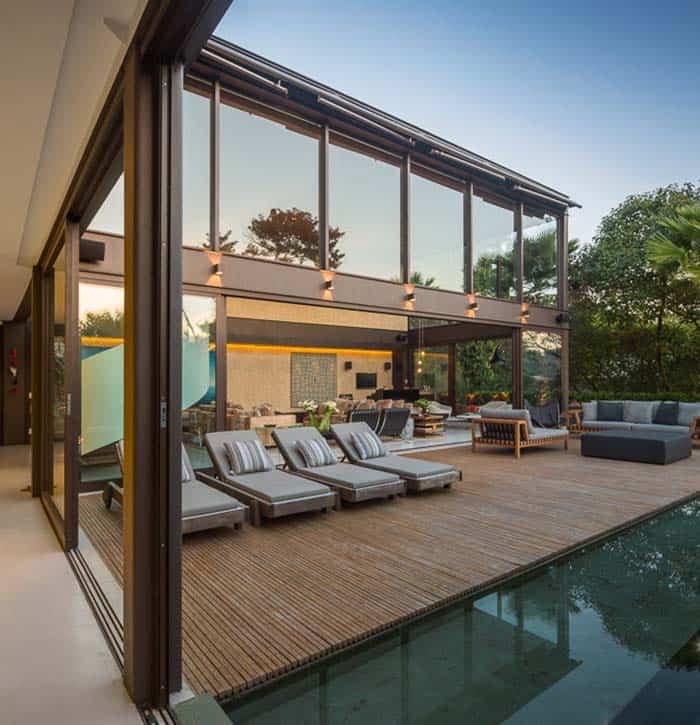 The deck is perfect for entertaining, with an expansive swimming pool and sun loungers, this outdoor living area invites relaxation. 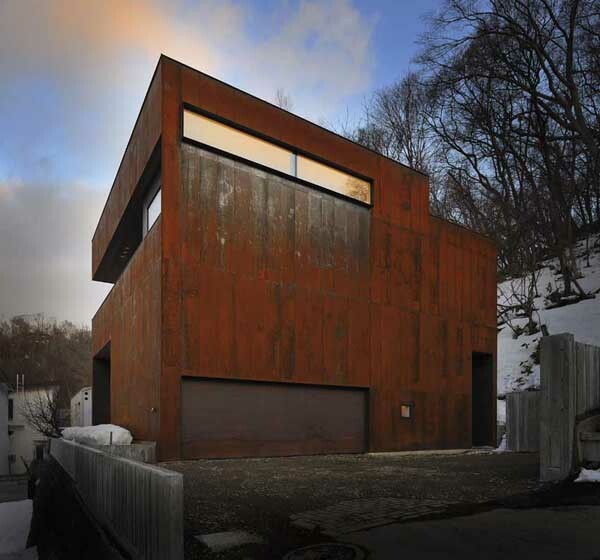 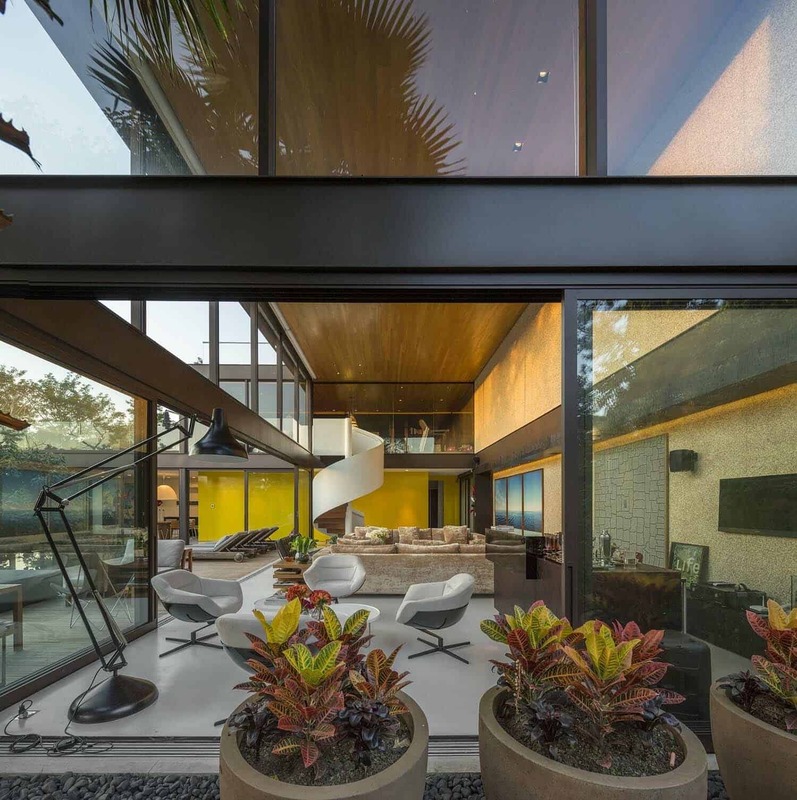 Overall, the mix of steel, glass and concrete is exquisite… Readers, please share with us what details in this home caught your eye and why in the Comments section below! 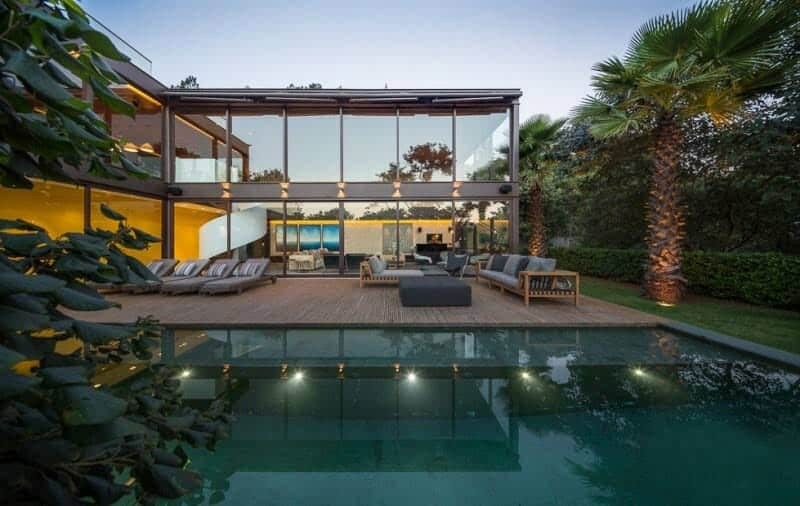 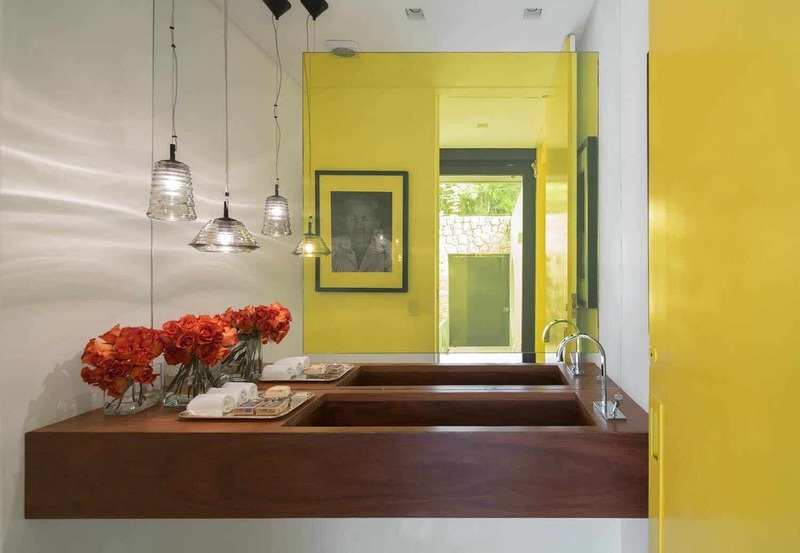 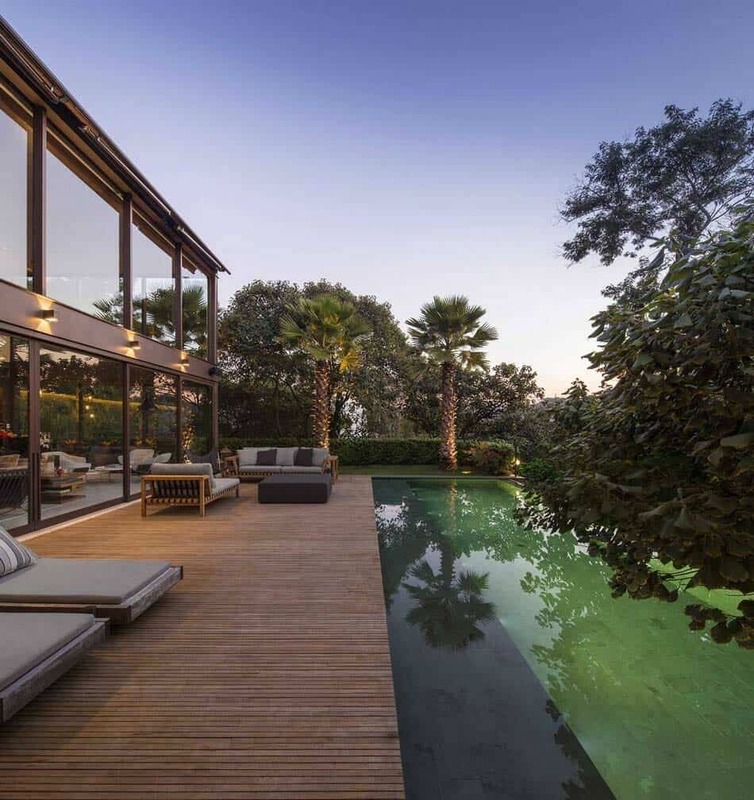 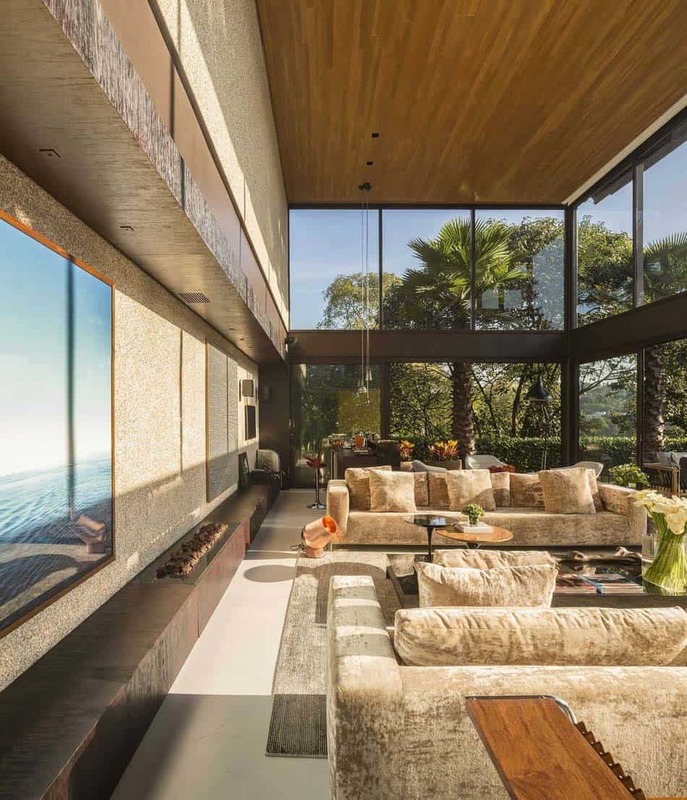 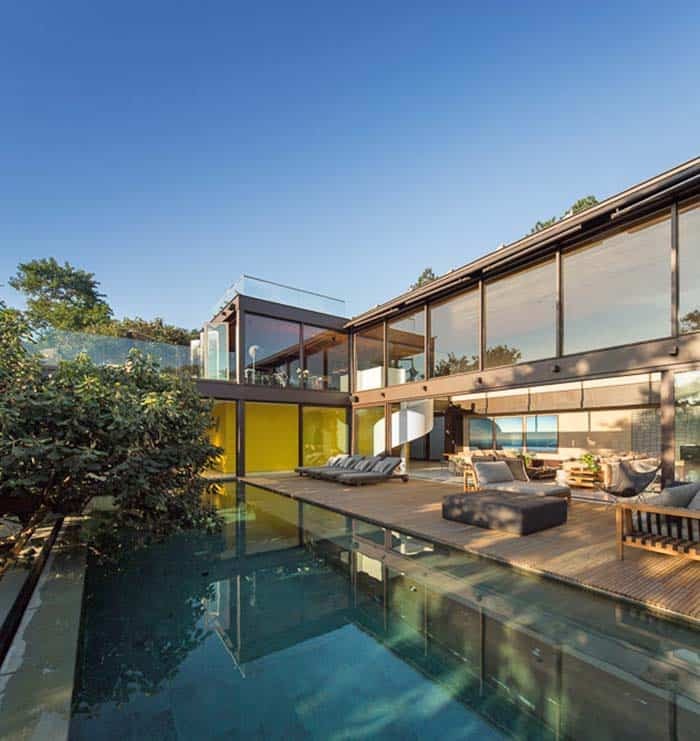 Note: Have a look at a couple of other amazing home tours we have featured here on One Kindesign from the portfolio of architect Fernanda Marques: A tropical summer retreat in Rio de Janeiro and Spectacular modern dream home in Malibu. 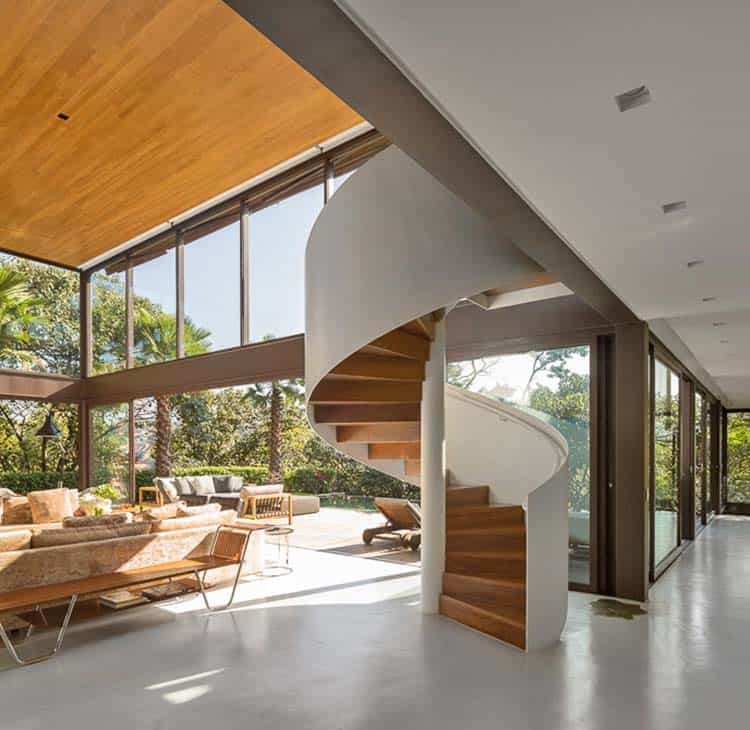 In the double-height living room, the helical staircase with structural features provides access to a mezzanine — containing a half-room, a fitness room and a terrace, equipped with a fireplace. 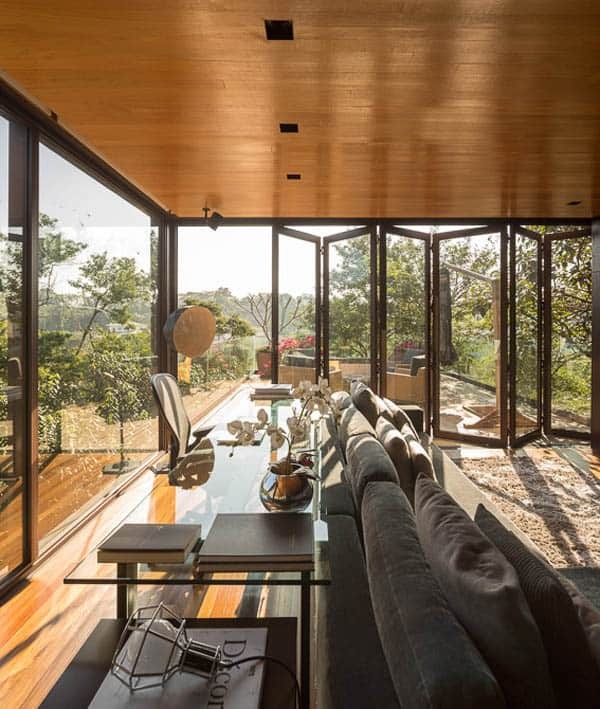 The sleeping quarters — preserved from view — contains a playroom and three bedrooms, all with en-suite bathrooms. 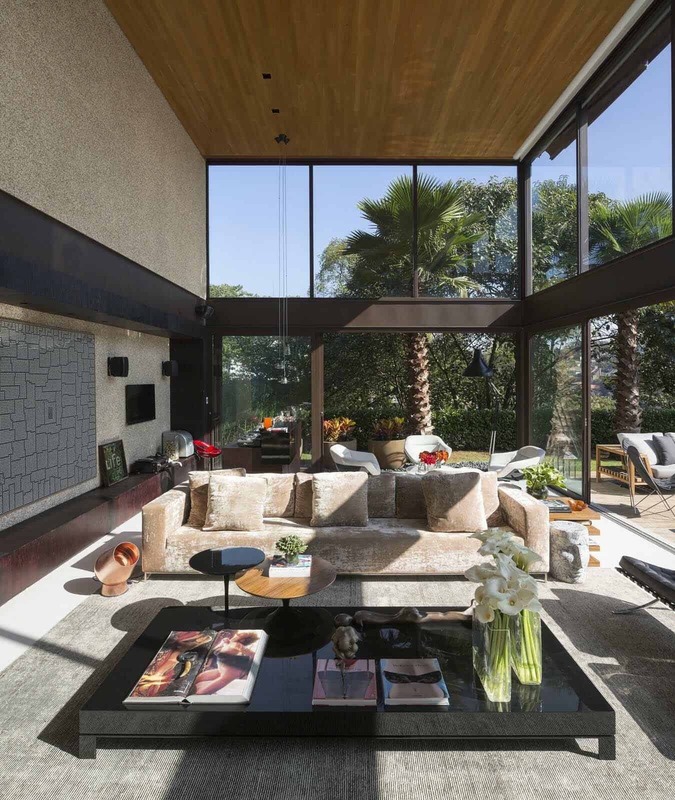 Access to the master bedroom is by means of a spacious hall, off which are the bathrooms – his and hers – and the dressing room. 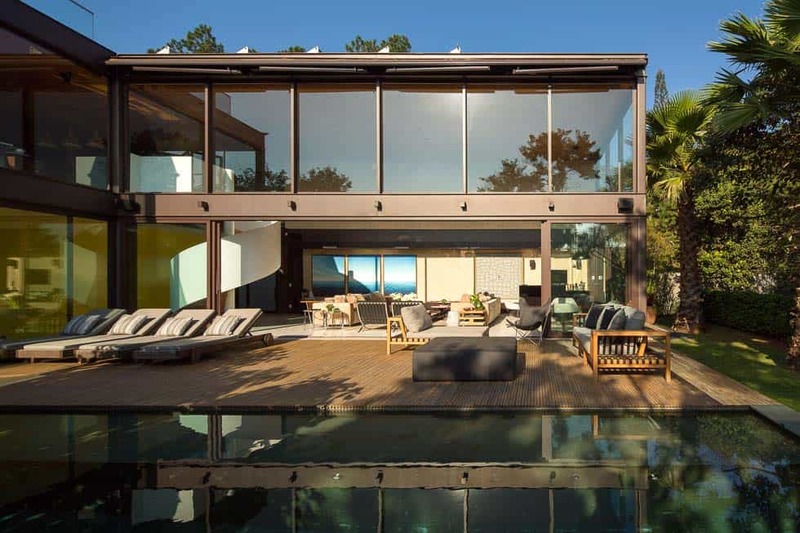 The living room is connected to the dining room by a glazed partition, integrating a deck, an infinite pool and the side garden. 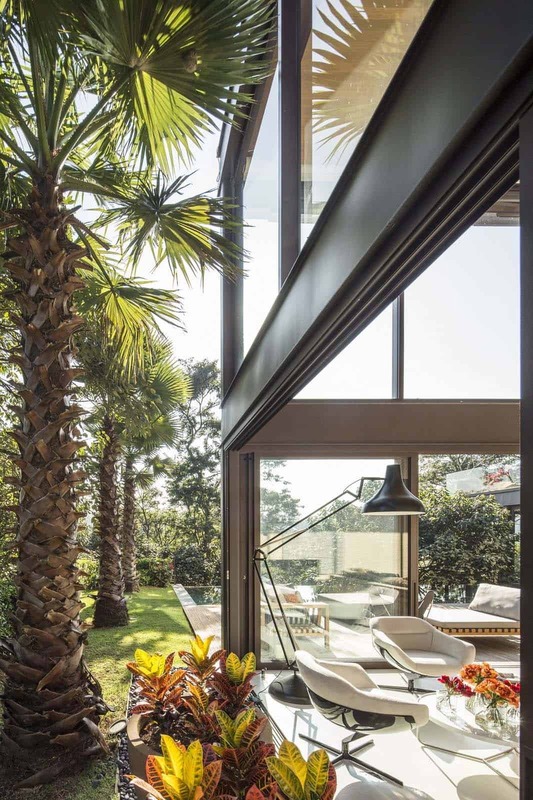 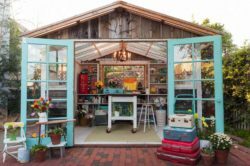 In the dining room, glazed doors open up to the garden. 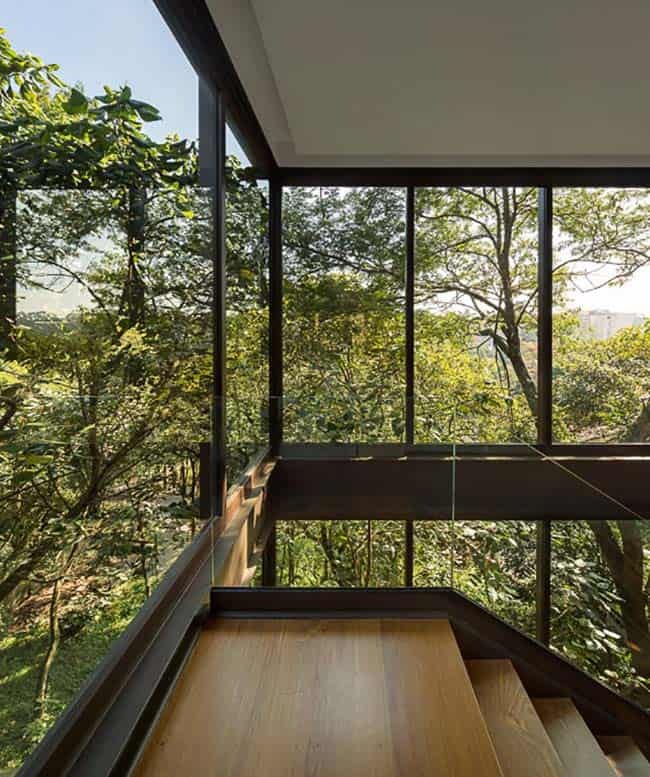 So, practically outlined only by glazed panels, the house seems to be immersed in the landscape. 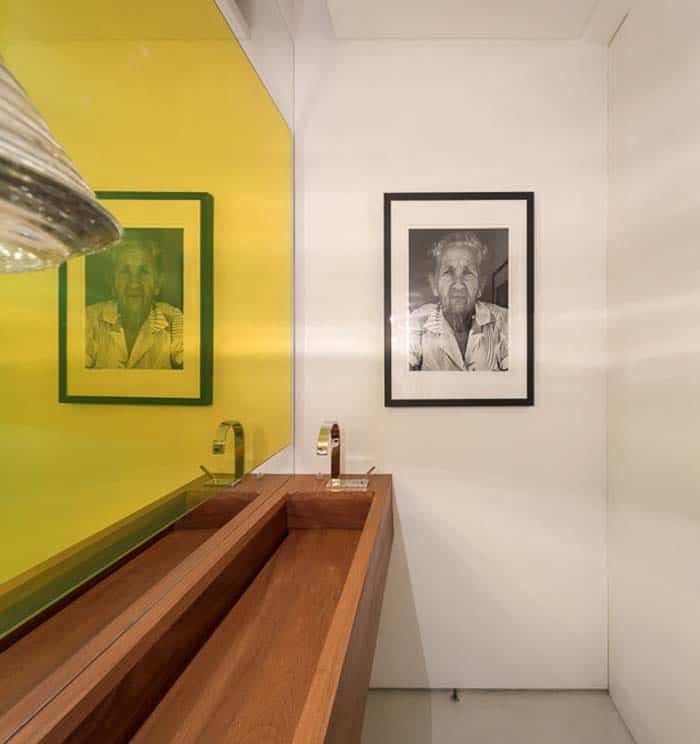 The interior design project aims at intimacy and uses indirect lighting, as well as warm coverings, such as wood.